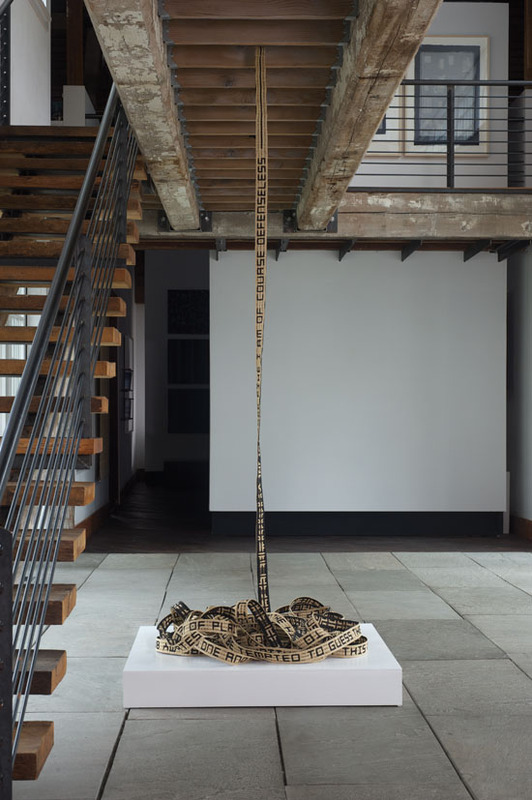 Visitors to Paperworks: medium as message at the Flinn Gallery, at the Greenwich Public Library (May 10th – June 21st) will see Takaaki Tanaka’s show-stopping work, A Hardened Nest, at the entrance to the exhibition. A Hardened Nest was created by arranging threads tightly in space and then covering these threads with a paper fiber mixture which, once dried, hold its given shape in space. 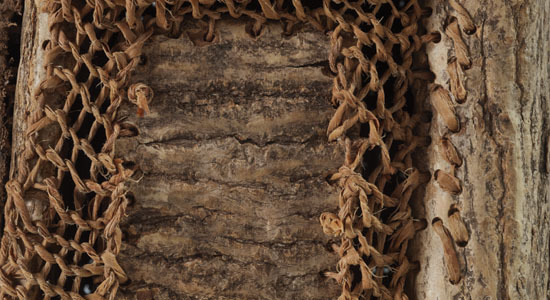 Combining prepared units, the artist has built a substantial wall of what he refers to as “nests,” which, he notes, are a fundamental starting point for many species of animal life. 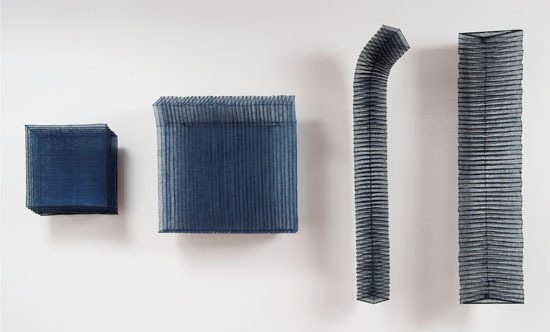 “I am interested in the way that fiber made from paper, a material harvested from plants, can take on a completely different aspect when it hardens to form a new shape inspired by the natural world,” says Tanaka. 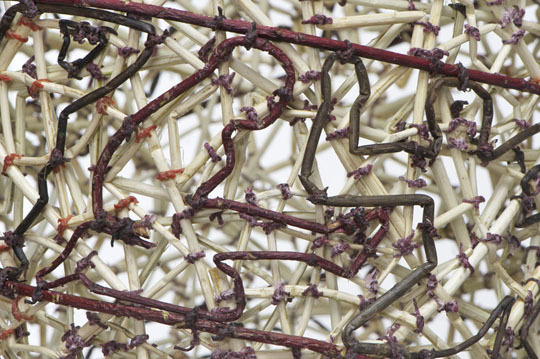 “The shapes become emotional shapes,” he says, that illustrate themes of nature, sense of touch and communication.” Tanaka’s work was featured in the exhibition and catalog for Fiber Futures: Japan’s Textile Pioneers at the Japan Society in New York 2011. Paper holds a powerful place in the history of human interaction, marking our milestones with birth certificates, marriage licenses and diplomas, maintaining our collective Paperworks: material as medium at the Flinn Gallery at the Greenwich Public Library, Greenwich, Connecticut from May 10th through June 21st, curated by Kelly Eberly and Barbara Richards and browngrotta arts, celebrates paper in another guise – as a medium for art. The work of more than 30 international artists inspired by and created from paper is featured in Paperworks. 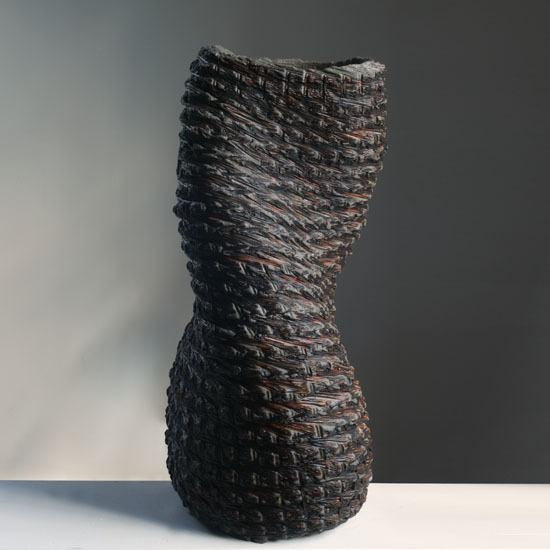 In them, paper has been stitched and plaited, carved and stacked, used as pulp to be molded and reformed, while newspapers, telephone books and dress patterns have been repurposed as vessels and sculpture. The artists in Paperworks treat varieties of paper their material as others would wood, linen, clay or marble. Several of the artists in Paperworks create structures of recycled papers. Wendy Wahl of the US uses pages of old encyclopedias to create an arbor of arches while Kazue Honma of Japan creates vessels from Japanese telephone books and Japanese artist Toshio Sekiji weaves wallworks newspapers from around the world. The exhibition includes constructions by the late US artist Ed Rossbach made of cardboard and newpaper and vessels made of dress pattern paper by US artist Dona Anderson. For Jane Balsgaard of Denmark, Naomi Kobayashi of Japan and Pat Campbell and Mary Merkel-Hess of the US, handmade and gampi paper create semi-translucent, ethereal objects that seem capable of floating. 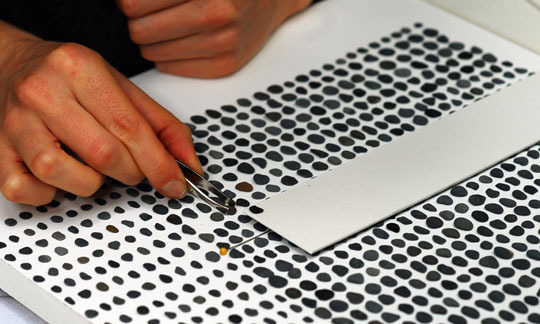 In Balsgaard’s case, the paper she uses is made from materials gathered near her summer home in Sweden. 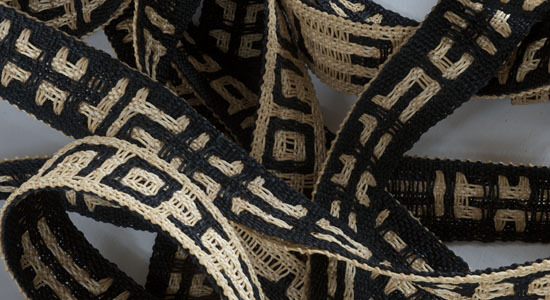 Mary Merkel-Hess uses gampi paper, papier-maiche and reed to create baskets, softly lit sculptures and wall works. Other artists, including Sylvia Seventy from the US, use molded paper pulp to create art, including in Seventy’s case, molded paper bowls populated with found and other objects. In conjunction with Paperworks: material as medium there will be a Curator’s Walkthrough on May 12th at 2 p.m. and an Artist’s Talk by artist Wendy Wahl on June 10th at 2 p.m. The Flinn Gallery is in the Greenwich Library, 101 West Putnam Avenue, Greenwich, CT 06830. An opening reception will be held May 10th from 6-8. For more information call: 203.622.7947. Meet with fiber artist and basketmaker John McQueen. Lawty charts the journey of her understated and abstract works which are strongly influenced by a comprehensive engagement with remote landscape, geology and the passage of time. 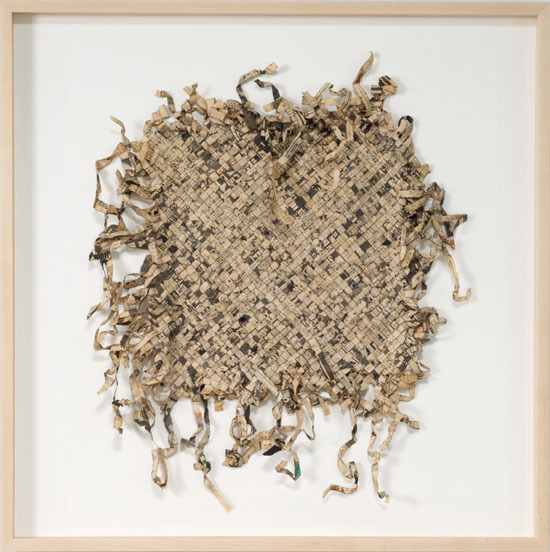 Seeking “an essential stillness,” Lawty’s constructed pieces and drawings in two and three dimensions explore repetition and interval in raffia, hemp, linen, lead, stone or shadow. Fiber and mixed media artist Sue Lawty will sign copies of her book, SUE LAWTY: rock-raphia-linen-lead. 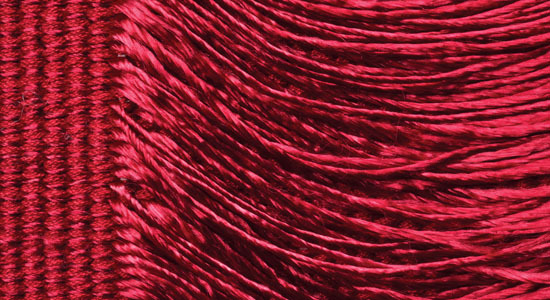 Meet with fiber and mixed media artist Norma Minkowitz. 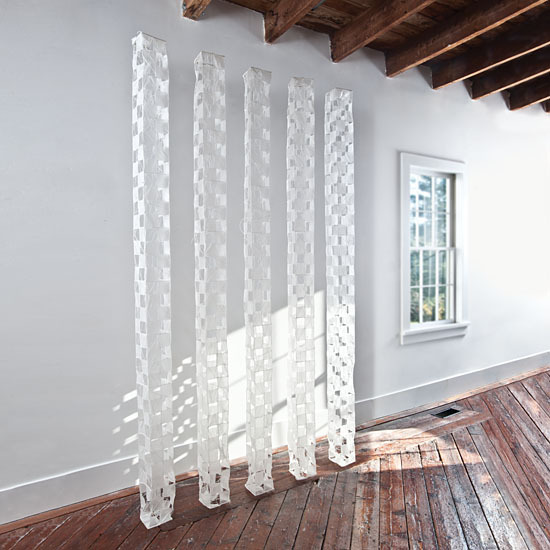 Chilean artist Carolina Yrarrázaval is one of the 25 artists whose work browngrotta arts will feature at SOFA NY. 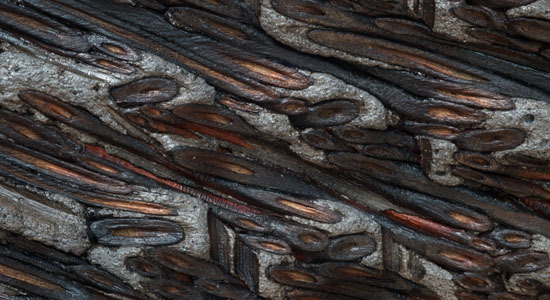 Throughout her career, Yrarrázaval has investigated and adapted traditional textile techniques from diverse cultures, especially Pre-Columbian techniques. “Abstraction has always been present as an aesthetic aim,” she says, “informing my choice of materials, forms, textures and colors.” She works with simple proportions, guided by an intuitive sense and avoiding the use of mathematical formulas. 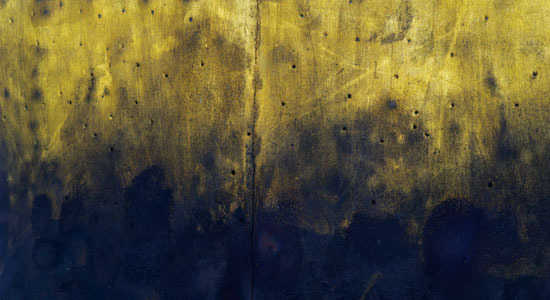 This simplification and freedom from conceptual constraints combine says the artist, “to reveal a language that conjures up other impressions, such as emptiness and the need for austerity and sensuality, silence and aloneness.”Yrazzával’s work has ben exhibited in the National Museum of Fine Arts, Santiago Chile; Interamerican Bank Gallery, Washington, D.C.; Pre-Columbian Arts Museum, Santiago, Chile; Le Recoleta Cultural Center, Buenos Aires, Argentina; Central Museum of Textiles, Lodz, Poland (International Triennial of Tapestry); Graz, Austria (International Textile Symposium); Goethe Institute, Santiago, Chile; Montevideo, Uruguay (Latin American Mini-Textile Exhibition); Valparaiso, Chile (Concurso de Arte Joven); Havana, Cuba (IIIrd Havana Biennial) and the Chilean Consulate Gallery, New York, New York. 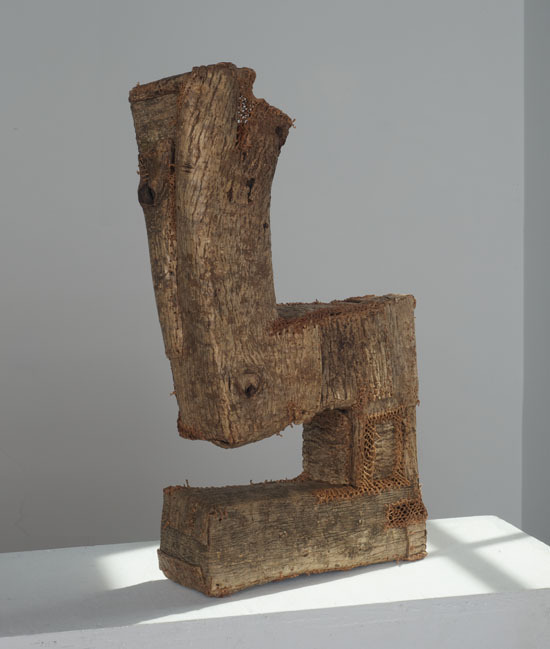 Sculptures of bark by Masako Yoshida are among the works that browngrotta arts will feature at SOFA NY. The constructions Yoshida envisions are built by interlacing sheets of walnut bark with string made of nettle. “I consider myself a member of society who wants to make works that open into the new world earnestly, one step at a time,” Yoshida finds that her work provides her “a means of release, allowing the truth to emerge and open the mind. In the process, I ask myself, ‘what is my connection to society? 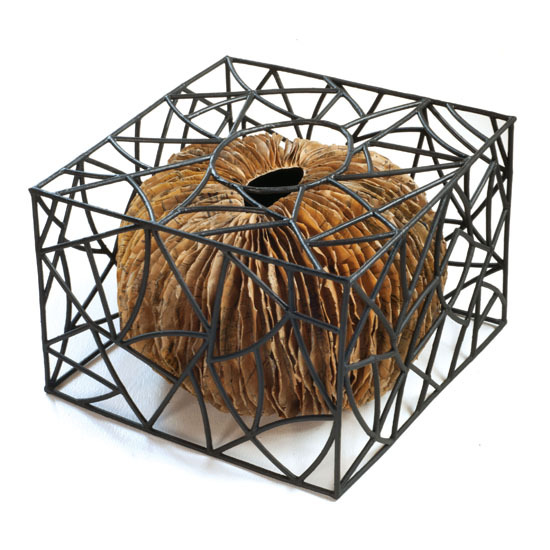 '” Yoshida has studied basketmaking with noted teacher and artist, Hisako Sekijima. She graduated from Musashino Art University, majoring in textiles and has since worked there as instructor. She has also taught at Tamagawa Institute. Her work has been exhibited at the Nagoya Trade and Industry Center (In Our Hands) Japan; Iwasaki Museum of Art, Yokohama, Japan; Megro City Museum, Japan; Takashimaya Department Store (Amu Kumu solo exhibition); Tachikawa, Japan; Nuno Annex Exhibition (solo, traveling exhibition); Wayne Art Center, Pennsylvania (Green for the Get Go). Yeonsoon’s work has been exhibited extensively in Asia and the US, including at the National Museum of Contemporary Art, Seoul, Korea (artist of the year exhibition); Art Institute of Chicago, Illinois; Insa Art Center, Seoul, Korea; Dowaru Gallery, Fukuoka, Japan; Museum of Ewha Women’s University, Seoul, Korea; Art Center for The Foundation of Korean Culture & Arts, Seoul; Moyer Arts & Crafts Center, Seoul, Korea; Museum of Arts & Crafts, Itami, Japan; Pittsburgh Arts Center, Pennsylvania; Daegu Convention Center, Korea; Honolulu Academy of Arts, Hawaii; Marronnier Art Center, Seoul, Korea; Cheongju Crafts Center, Korea; Korea Economic Daily, Seoul, Korea. Valoma’s work has been exhibited at the Textile Museum, Washington, D.C.; Los Angeles County Museum of Art ; De Young Museum of Art, San Francisco, California; Blanden Memorial Art Museum, Iowa; Gulbenkin Foundation, Lisbon, Portugal; Oliver Art Center, California College of Arts and Crafts, Oakland; North Carolina State University Museum, Raleigh; Hoffman Gallery, Oregon School of Arts and Crafts, Portland; Ginza Art Space, Tokyo, Japan; and Montclair State University, New Jersey . 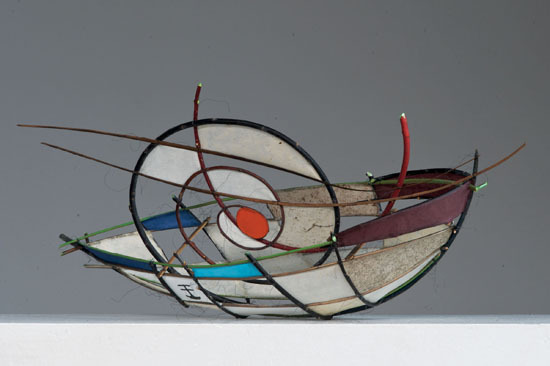 Titze’s work has appeared at Grønbechs Gard, Bornholm, Denmark (solo exhibition); Roskilde City Hall, Denmark; Grassi Museum Leipzig, Germany; the National Crafts Council, Kilkenny, Ireland; Trapholt Museum, Kolding, Denmark; Landart Lolland-Falster, Denmark; Munich, Germany; Wayne Art Center, Pennsylvania. He received the Best One-of-a-Kind Object, award at the Arts and Crafts Fair, Copenhagen, Denmark and the Bavarian State Prize, Meister der Moderne, Munich, Germany. Grethe Sørensen of Denmark is one of the artists whose work will be featured by browngrotta arts at SOFA NY. Eighteen large weavings by Sørensen were the subject of a dramatic installation at the Round Tower in Copenhagen, Denmark earlier this year. 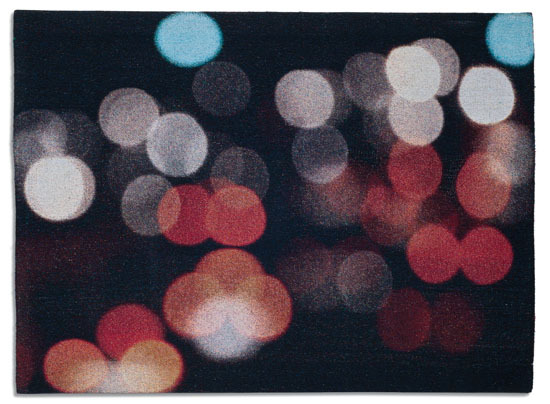 The works for the exhibition, Traces of Light: A Sensory Image of City Light, began with an unfocused camera that created images of a poetic universe based on headlights, traffic lights, shops and advertising signs, Sørensen transformed thse images into Jacquard weavings. 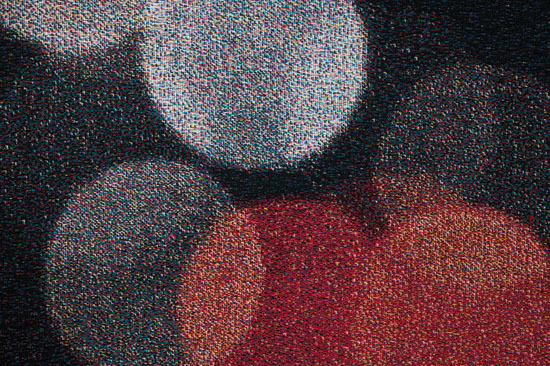 The granular colored spots that result, the artist explains, may be “conceived as a picture of the throbbing life of the city seen on cellular level, or as a visual expression of another dimension.” Works from the Traces of Light series will be featured at SOFA NY. 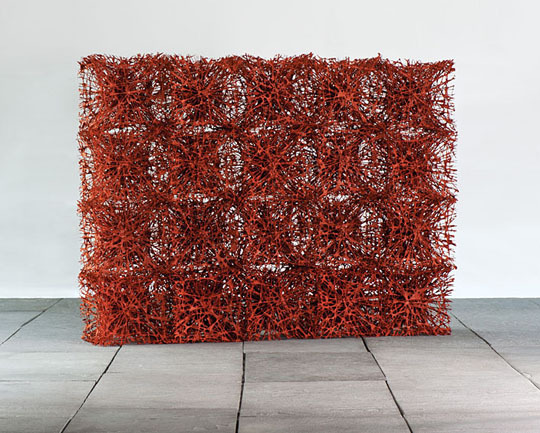 Sørensen’s work has been exhibited in numerous corporate, public and private venues, including the Museum for Applied Art, Copenhagen, Denmark; Musée des Arts Decoratifs, Paris, France; Maison de la Culture d’Arlon, Luxembourg; (Nordic Textile Triennials); South Jutland Museum of Art, Tønder, Denmark; Institute for Industrial Design, Warsaw, Poland; Museum of Art, Sao Paulo, Brazil; Museum of Decorative Arts and Design, Ghent, Belgium; Lane Municipal Gallery, Erfurt, Germany; Museum of Art, Ein Harod, Israel; Nagoya, Japan; North Dakota Museum of Art, Grand Forks; Maison de la Culture d’Arlon, Luxembourg; Academy of Art & Design, Tsinghua University, Beijing, China and Trondor Engineering in Norway. 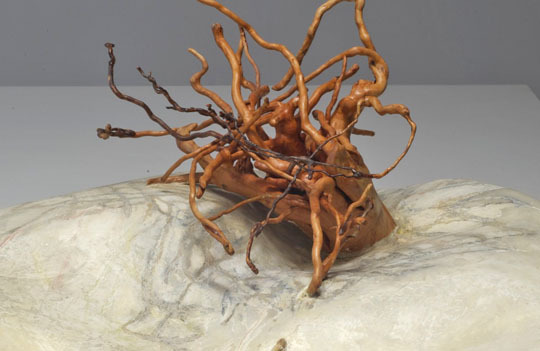 At SOFA NY, browngrotta arts will present the work of Korean artist Jin-Sook So who will attend the exposition in New York. 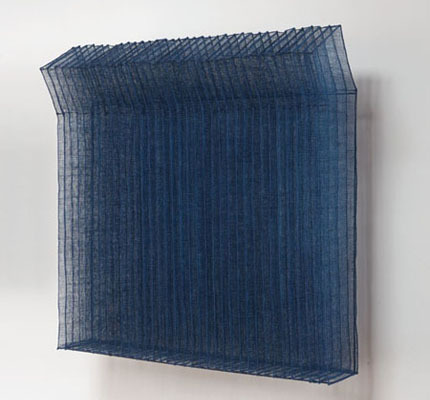 Since 1984, So has been using transparent steel mesh cloth, which she burns, paints, electroplates in gold or silver, sews and shapes to create sculptural and wall pieces. 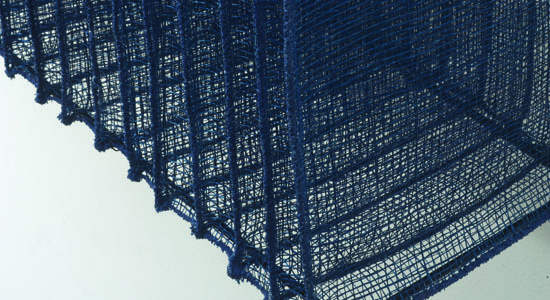 In creating Steel Mesh Untitled, which will be exhibited at SOFA, So was inspired by Korea’s landscape. She has been an artist-in-residence at the Youngeun Museum outside of Seoul for the last year. So’s work has been exhibited extensively in the US and abroad, including at the Röhsska Arts and Crafts Museum, Göteborg, Sweden; Nationalmuseum, Osaka, Japan; Skissernas Museum, Lund Sweden; Brooklyn Museum, New York; National Museum, Stockholm, Sweden; Museum of Arts and Design, New York, New York; Pittsburgh Center for the Arts, Pennsylvania; Kulturhuset, Stockhom, Sweden; Museé d’Angers, France; Kwang-Ju City Museum, Korea; Lane Municipal Gallery, Erfurt, Germany; Savaria Museum, Szombathely, Hungary; Academy of Arts & Design, Tsinghua University, Beijing, China.